Dr. Rajiah is a Cardiovascular Imaging Fellow at the Cardiovascular Imaging Laboratory, Imaging Institute, Dr. Halliburton is a Medical Imaging Scientist, Cardiovascular Imaging Laboratory, Imaging Institute, and Cardiovascular Medicine, Heart and Vascular Institute, and Dr. Flamm is the Section Head of the Cardiovascular Imaging Laboratory, Imaging Institute, and Cardiovascular Medicine, Heart and Vascular Institute, at Cleveland Clinic, Cleveland, OH. Over the past decade, computed tomography (CT) has emerged as an important noninvasive imaging modality for the evaluation of cardiovascular diseases.1 However, the increasing use of cardiac CT has raised concern about the long-term health consequences of medical radiation, particularly stochastic effects, such as cancer, and the probability of these effects has no clear threshold dose and increases linearly with the dose.2,3 To reduce radiation dose without compromising image quality, cardiovascular imagers have developed and adopted several novel scan acquisition techniques and scan parameter modifications.4 This review discusses the various dose-reduction strategies available for cardiovascular CT and how these strategies can be employed in various clinical protocols. 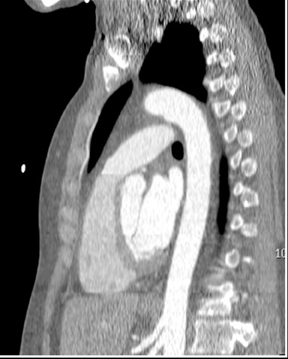 The proper selection of patients is a critical step in reducing overall radiation burden from CT. Cardiac CT should be performed only when the benefits of the scan outweigh both the risks of the imparted radiation and when similar diagnostic information cannot be obtained from a different imaging modality that does not expose the patient to ionizing radiation. 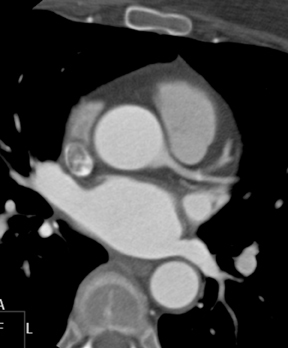 Appropriateness criteria for cardiovascular CT have been published by various societies; these criteria take into account pretest probability of cardiovascular disease, patient characteristics, procedural risk, and the expected benefit to the patient.1 If CT is deemed inappropriate when these criteria are applied, tests without ionizing radiation exposure should be performed instead. 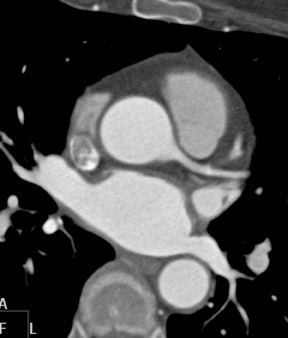 Additionally, CT should not be performed if evidence suggests that diagnostic images would be difficult to obtain in a particular patient (eg, CT coronary angiography in a patient with an irregular heart rhythm or a heavy coronary calcium burden or with an irregular heart rhythm). Reducing the radiation dose can be achieved by manually or automatically altering several scanning factors. These dose-reduction strategies are reviewed in this article. Filters that are placed beneath the x-ray tube selectively attenuate low-energy x-rays that do not contribute to image formation, but do add to the total radiation dose.4 Filtered beams have lower intensity and higher mean energy, but the maximum energy is not altered. Depending on patient size, the imager can use small, medium, or large flat and bow-tie filters; the choice of filter size affects both the acquisition field-of-view (FOV) and the radiation dose. The smallest filter allowing the entire region of interest to be within the FOV should be used. Similarly, cardiovascular imagers can use prepatient z-collimators to reduce radiation reaching the patient.5 Prepatient collimators are positioned close to the x-ray tube, allowing the width of the collimator to be altered. This limits the x-ray beam to the section thickness intended at the area of interest in the z-axis and avoiding unnecessary radiation exposure in adjacent tissues. On a single-slice CT, a prepatient collimator also determines the slice thickness. Bismuth-impregnated latex shields are another option for reducing radiation dose; specifically, these shields can reduce radiation dose to the breast when the shields are located between the x-ray beam and the breast (ie, in anteroposterior projections of CT, but not in posteroanterior projections). Although bismuth shielding has been found to reduce radiation dose to the breast by 29% to 57%,6,7 such shielding is also associated with degradation of image quality because of increased pixel attenuation values from beam-hardening effects, higher levels of image noise, streak artifacts, and internally scattered radiation. The routine use of bismuth shields is therefore not recommended for patients undergoing cardiovascular CT.4 When the shields are used, they should be placed after the topogram is performed so that increased radiation from anatomic tube current modulation in response to the shields can be prevented. The scan length is defined as the volume that is irradiated along the z-axis (cranio-caudal axis) of the patient. Radiation dose is directly proportional to the scan length; hence, the scan length should be tailored to the specific clinical indication so that tissues outside the field of interest are not unnecessarily exposed to radiation.8 For instance, scan length should involve only the craniocaudal extent of the heart for calcium scoring and CT angiography, but must involve the entire thorax for the evaluation of bypass grafts. Although imagers typically use topogram-based prespecified scan lengths, the scan should be stopped early if the anatomy of interest is covered before the planned z end-point is reached. Several acquisition modes are available for cardiovascular imaging, each of which can affect the radiation dose. Here we review the current commercially available acquisition modes for cardiovascular imaging, including retrospective and prospective electrocardiogram (ECG) referencing, standard and wide detector arrays, and low- and high-pitch techniques. The retrospective ECG-gated low-pitch helical acquisition technique, the most commonly used mode for cardiac CT, is associated with the least susceptibility to cardiac motion artifacts, but also with the highest dose of radiation. With this method, continuous data and ECG acquisition occurs simultaneously during gantry rotation and table translation until the entire scan length is covered; after this, images are reconstructed, with data retrospectively gated to the ECG signal. If the full tube current is used throughout the cardiac cycle, images with similar noise levels can be reconstructed at any phase of the cycle. Radiation dose associated with this technique can be significantly reduced with ECG-based tube current modulation. In the prospective ECG-triggered axial mode of acquisition, data are acquired during gantry rotation while the table remains stationary. Data acquisition with this technique is limited to a predefined phase of the cardiac cycle and is prospectively triggered with the ECG signal (QRS complex), which is simultaneously monitored. After data are acquired during a single-gantry rotation, the table moves to the next position and data acquisition is continued until the entire scan length is covered. A dose reduction of up to 68%, without significant impairment in image quality, has been associated with this technique versus low-pitch helical imaging with retrospective ECG gating.9 Functional information cannot be obtained with this imaging technique on most scanners however, some scanners do, however, allow for data acquisition of data during 2 or more phases of the cardiac cycle, though again at the expense of higher radiation dose. With this mode of acquisition, misalignment artifact may be seen if the position of the heart varies slightly from cycle to cycle or if there are alterations in the length of the cardiac cycle; the probability of this artifact increases with the number of table movements required. On very wide-array scanners (eg, 320 detectors x 0.5-mm detector row width), z coverage of up to 16 cm can be achieved; additionally, the heart can be imaged within 1 heartbeat and without table movement, thus eliminating the likelihood of misalignment artifact. A regular and low heart rate is necessary in patients undergoing CT scanning with this mode, as this technique depends on an accurate estimation of the upcoming R-R interval duration.4 To this end, some scanners have an automatic arrhythmia-rejection technique that postpones image acquisition until the patient’s heart rate is stable. The data acquisition window may also be widened in patients with high or irregular heart rates to enable minor retrospective adjustments of the reconstruction window; this technique, however, is associated with a higher radiation dose. Tube current is defined as the number of electrons accelerated across the x-ray tube per unit of time; tube current-time product is defined as the product of tube current and time. Both factors indicate x-ray tube output. Radiation dose is directly proportional to the tube current, whereas image noise is inversely proportional to the square root of the tube current; hence, lowering the tube current proportionally lowers the radiation dose, but increases image noise. For cardiovascular CT, the lowest possible tube current producing images with acceptable noise levels should be used. To reduce total radiation exposure, imagers can modulate tube current during various phases of the cardiac cycle (ECG-based modulation) or according to body thickness (anatomic-based modulation). In a retrospective ECG-gated low-pitch helical acquisition, images are needed throughout the cardiac cycle for functional evaluation of ventricles or valves; for most remaining indications, images are needed from only a single phase of the cardiac cycle. For imaging of coronary arteries and the aorta, the mid- to end-diastolic phase (75% of R-R interval) typically is used when the heart rate is low, whereas the iso-volumic phase of relaxation (40% of R-R interval) typically is used when the heart rate is high. 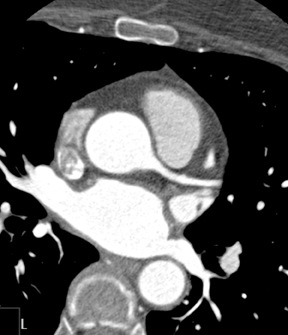 Pulmonary veins are also imaged in systole as they have maximum caliber during this phase. In ECG-based tube current modulation, full tube current is typically applied during a single phase of the cardiac cycle and the tube current is reduced (typically 20%-25% of full tube current) or completely switched off for the remaining phases of the cardiac cycle. With this technique, radiation doses can be reduced by up to 50%, depending on the patient’s heart rate,13 the minimum tube current value,14 and the duration of the maximum tube current phase.14 Images with lower tube current have higher noise levels, but such images can still provide information about functional parameters. Additionally, imagers can improve the quality of these images can be improved by increasing the reconstruction slice thickness. Because this method of modulating tube current is based on averaging previous R-R interval changes, this technique requires a regular and preferably low heart rate. An irregular heart rhythm may lead to an unintended decrease in tube current during a portion of the cardiac cycle that is needed for diagnostic evaluation. In patients with irregular heart rhythms, modulation of tube current may be suspended automatically when beat-to-beat variation exceeds a predefined threshold. Alternatively, the window of maximal tube current may be widened. However, both of these methods will increase the overall radiation dose. With this method of modulation, the tube current is adjusted according to patient size or anatomic shape. Because the tube current necessary to effectively scan patients is directly proportional to patient size, imagers can use a lower tube current and thus lower radiation dose in thin patients, whereas they must use a higher tube current in obese patients. Imagers can assess patient size through visual inspection, measurement of body weight or body mass index (BMI), measurement, noise measurement from a cross-sectional prescan, cross-sectional measurement from a topogram, or noise measurement from a cross-sectional prescan. Online tube current modulation during acquisition can also be performed based on the thickness of the body part along the path of the x-ray (as estimated by the topogram): imagers can reduce tube current can be reduced for x-ray projections in which the body part is thin. This online tube current modulation can reduce the radiation dose by 20% without increasing noise on thoracic CT images.15 For cardiovascular CT scans, this technique is used to determine the current that is necessary to achieve a desired noise level based on the tissue thickness in from scout images. Once the tube current is selected, online tube current modulation during the scan is based on the ECG signal alone. Tube potential, defined as the electrical potential across the x-ray tube, determines both the energy and the intensity of the x-ray beam. The radiation dose is proportional to the square of the tube voltage: reducing the tube potential from 120 to 100 kVp can lead to a dose reduction of up to 53%,9 as low-potential x-rays have lower energy and thus lower penetration.16 Because noise is inversely proportional to the tube potential, image noise increases (by up to 26%) with lower tube potential.9 In addition, signal, signal-to-noise ratio, and contrast-to-noise ratio are increased, as there is a higher probability of photoelectric interaction than Compton interaction at lower energy levels.9 A lower dose of iodinated contrast material can therefore be used to achieve the same blood signal, and the attenuation threshold values should be set at higher levels when automatic bolus tracking is used. Image noise increases with body weight because of scattering and radiation absorption, so a tube potential of 100 kV should be used for nonobese patients (weight ≤90 kg; BMI ≤30 kg/m2).16 In obese patients (weight >90 kg; BMI >30 kg/m2), 120 to 140 kV can be used. In children and very thin patients, a tube potential of 80 kV may be used. In protocols that require a higher contrast-to-noise ratio (eg, myocardial perfusion imaging), a tube potential of 80 kV should be used. Reconstructed slice thickness does not directly affect x-ray exposure; however, this factor does determine how many photons contribute to the final image in the filtered back-projection technique, with noise being inversely proportional to the square root of reconstructed slice thickness. For high special resolution, thinner slices must be used for high spatial resolution, but these images will also have higher noise levels, which may require the use of higher tube potential or current. Although thicker slices have lower spatial resolution, they also have lower noise levels, allowing for the use of a lower tube potential or current (Figure 2). Imagers should use the maximum reconstructed slice thickness providing the required information for a clinical indication should be used, as the overall tube output can then be reduced and thus radiation dose minimized. The goal of cardiovascular imagers should be to use a combination of the above-mentioned dose-reduction techniques to limit radiation dose to the lowest possible amount without compromising image quality. The CT protocol should always be customized to the specific clinical question (Table 1). For certain indications, it is possible to use protocols with lower spatial or temporal resolution or with higher noise without significantly compromising the diagnostic quality of the images. For example, evaluating coronary arteries or cardiac valves requires high spatial and temporal resolution; however, calcium scoring and evaluation of pulmonary veins, coronary artery origin, and myocardium require neither high spatial nor temporal resolution. If fine detail is not absolutely essential, a lower tube current can be applied and thicker slices can be reconstructed. However, imagers must exercise caution in applying these dose reductions, as reducing the dose too much could result in poor-quality, nondiagnostic results, which will necessitate a repeat study and a net increase in radiation dose. Radiation dose from cardiovascular CT should be limited to a level as low as reasonably achievable without compromising diagnostic image quality. Additionally, CT should be performed only when the procedure is clinically indicated and when the benefit to the patient outweighs the risks of stochastic effects of low-dose radiation and that of forgoing a necessary examination. The CT protocol should be customized to the individual clinical scenario and to the patient characteristics. In patients with low heart rate, regular heart rhythm, and low body weight, low-dose CT protocols should be the default in patients with a low heart rate, regular heart rhythm, and low body weight. The authors wish to thank Ms. Megan Griffiths, a scientific writer for the Imaging Institute, Cleveland Clinic, for her editorial assistance. Taylor AJ, Cerqueira M, Hodgson JM, et al. ACCF/SCCT/ACR/AHA/ASE/ASNC/NASCI/SCAI/SCMR 2010 appropriate use criteria for cardiac computed tomography. A report of the American College of Cardiology Foundation Appropriate Use Criteria Task Force, the Society of Cardiovascular Computed Tomography, the American College of Radiology, the American Heart Association, the American Society of Echocardiography, the American Society of Nuclear Cardiology, the North American Society for Cardiovascular Imaging, the Society for Cardiovascular Angiography and Interventions, and the Society for Cardiovascular Magnetic Resonance. J Am Coll Cardiol. 2010;56:1864-1894. Gerber TC, Carr JJ, Arai AE, et al. Ionizing radiation in cardiac imaging: A science advisory from the American Heart Association Committee on Cardiac Imaging of the Council on Clinical Cardiology and Committee on Cardiovascular Imaging and Intervention of the Council on Cardiovascular Radiology and Intervention. Circulation. 2009;119:1056-1065. Einstein AJ, Henzlova MJ, Rajagopalan S. Estimating risk of cancer associated with radiation exposure from 64-slice computed tomography coronary angiography. JAMA. 2007;298:317-323. Halliburton SS, Abbara S, Chen MY, et al. SCCT guidelines on radiation dose and dose-optimization strategies in cardiovascular CT. J Cardiovasc Comput Tomogr. 2011;5:198-224. Walker MJ, Olszewski ME, Desai MY, et al. New radiation dose saving technologies for 256-slice cardiac computed tomography angiography. Int J Cardiovasc Imaging. 2009;25:189-199. Hopper KD, King SH, Lobell ME, et al. The breast: In-plane x-ray protection during diagnostic thoracic CT—shielding with bismuth radioprotective garments. Radiology. 1997;205:853-858. Fricke BL, Donnelly LF, Frush DP, et al. In-plane bismuth breast shields for pediatric CT: Effects on radiation dose and image quality using experimental and clinical data. AJR Am J Roentgenol. 2003;180:407-411. Hausleiter J, Meyer T. Tips to minimize radiation exposure. J Cardiovasc Comput Tomogr. 2008;2:325-327. Bischoff B, Hein F, Meyer T, et al. Impact of a reduced tube voltage on CT angiography and radiation dose: Results of the PROTECTION I study. JACC Cardiovasc Imaging. 2009;2:940-946. Leschka S, Stolzmann P, Desbiolles L, et al. Diagnostic accuracy of high-pitch dual-source CT for the assessment of coronary stenosis: First experience. Eur Radiol. 2009;19:2896-2903. Alkadhi H, Stolzmann P, Desbiolles L, et al. Low-dose, 128-slice, dual-source CT coronary angiography: Accuracy and radiation dose of the high-pitch and the step-and-shoot mode. Heart. 2010;96:933-938. Wagner M, Butler C, Rief M, et al. Comparison of non-gated vs. electrocardiogram-gated 64-detector-row computed tomography for integrated electroanatomic mapping in patients undergoing pulmonary vein isolation. Europace. 2010;12:1090-1097. Jakobs TF, Becker CR, Ohnesorge B, et al. Multislice helical CT of the heart with retrospective ECG gating: Reduction of radiation exposure by ECG-controlled tube current modulation. Eur Radiol. 2002;12:1081-1086. DeFrance T, Dubois E, Gebow D, et al. Helical prospective ECG-gating in cardiac computed tomography: Radiation dose and image quality. Int J Cardiovasc Imaging. 2010;26:99-107. Mulkens TH, Bellinek P, Baeyaert M, et al. Use of an automatic exposure control mechanism for dose optimization in multi-detector row CT examinations: Clinical evaluation. Radiology. 2005;237:213-223. Leschka S, Stolzmann P, Schmid FT, et al. Low kilovoltage cardiac dual-source CT: Attenuation, noise, and radiation dose. Eur Radiol. 2008;18:1809-1817. Leipsic J, Labounty TM, Heilbron B, et al. Adaptive statistical iterative reconstruction: Assessment of image noise and image quality in coronary CT angiography. AJR Am J Roentgenol. 2010;195:649-654. De Geer J, Sandborg M, Smedby O, Persson A. The efficacy of 2D, non-linear noise reduction filtering in cardiac imaging: A pilot study. Acta Radiologica. 2011;52:716-722. Strategies for dose reduction in cardiovascular computed tomography. Appl Radiol.